For the three day weekend, we unpacked and unpacked and unpacked.Side note, I had the TV on most of the holiday weekend as we’re working around the house. And the people on TV were seriously bumming me out as they kept pointing out that summer is coming to an end. But this morning, I realized that it means we’re about to enter the holiday season. And I LOVE LOVE LOVE THE HOLIDAYS!! Seriously, LOVE. I am no longer bummed about the end of summer because I am totally psyched about Fall, KT’s Birthday, our One Year Anniversary, Halloween, Thanksgiving, and Christmas!! Okay, getting back to the house. Looking at our latest kitchen and living room make-overs, you might wonder how messy can these two rooms possibly get when we ended with essentially bare rooms. The answer is Very Messy. 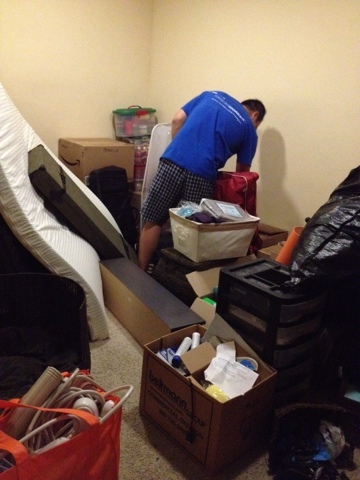 Everything we owned was shoved into the spare room and garage/office as we’re updating the main rooms of the house. 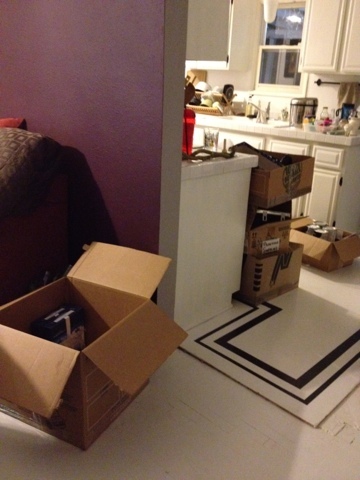 Now that we’re done with the major tedious changes, we really need to do some real unpacking. For some crazy reason beyond our comprehension, there’s no place to put anything. We kept reasoning with ourselves that if we moved from a same sized place, then everything should fit… right? Wrrrooonnng. Instead of opening one box and putting the content away in their permanent home, we find ourselves not having space for our things. So we put the open box in its next temporary holding place – the living room, and we open another box from the spare room. Before we know it, the living room and kitchen looks like the Tasmanian Devil took a spin through our house. Even though our house looks worse at the end of the three day weekend than at the beginning of it, I’m sure we made some progress. It’s just hard to see. Really hard. 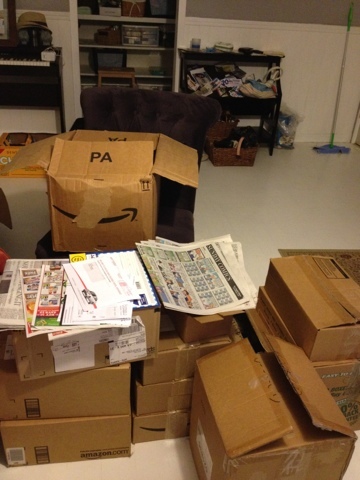 This entry was posted in Weekly Progress and tagged unpacking.